Keeping in mind the demand for high performance drives and huge storage capacities, Silicon Power unveils the latest addition to its USB 3.0 series of portable hard drives with a 1TB model. The claimed ‘ultra-high capacity’ version is said to meet the requirements of even the most demanding computer gamer. Along with the 320GB, 500GB, 640GB and 750GB models, the 1TB edition is said to complete the company’s series of USB 3.0 portable drives. Fitted with an LED indicator, users can identify whether the drives are running or transferring data. The company offers enhanced storage in three series namely SP Armor, SP Stream and Diamond. Equipped with shock-resistance and high read-write speeds, the Armor series is also claimed to achieve U.S. military drop and waterproof standards. Designed with a race car form factor, the SP streams series comprises the S10 and S20 models and is said to allow users to access photos in a matter of seconds. Its elegant protective case creates a stylish look for the device. Whereas, the Diamond range features the classic checkerhead design. With its sleek and compact look, the product is stated to be a stylish option. Equipped with an exclusive SP Widget toolkit, the drives are promoted as perfect consumer-friendly data transmission and storage devices. To make the series eco-friendly, a power saver mode is also available. Along with Norton Antivirus 2011, the SP Widget also features several back-up and security tools which are available as free download. 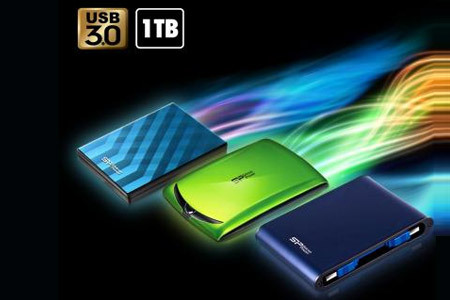 The price and availability for the Silicon Power USB 3.0 1TB series of portable hard drives is not mentioned by the company.